(Nanowerk News) In an algae-eat-algae world, it's the single-celled photosynthetic organisms at the top (layer of the ocean) that absorb the most sunlight. Underneath, in the sublayers, are cryptophyte algae that must compete for photons that have filtered through the upper depths. The key to their survival, a study published on December 8 in Chem ("Vibronic Enhancement of Algae Light Harvesting") reveals, is the ability to more than triple how fast they capture light energy and funnel it through to molecules that convert it into food. The finding could generate new bio-inspired designs for light-harvesting systems. Through experiments using ultrashort laser pulses, Princeton University researchers found that the surge in algal light capture results from how energy moves from one light-absorbing molecule to another. Over a course of nanoseconds, energy from light hops between thousands of molecules, and the exchange of energy from molecule to molecule can cause the molecules to vibrate. The increase in vibrations as light begins to be absorbed by the cryptophyte algae sets off a chain reaction that allows additional light energy to be brought in at a faster rate. This enhancement was observed at temperatures the algae would experience in nature. "Sunlight, even on a bright day, is a pretty weak source of photons--too weak to drive the enzyme chemistry in photosynthesis--so what cryptophyte algae do is cast a net out to catch more photons at a faster rate," says lead author Gregory Scholes, a professor of chemistry at Princeton. "Because the light they're getting is much weaker than that received by a plant on the earth, photon harvesting is much more important." Current light-harvesting technologies are using similar strategies to improve absorption by inorganic molecules, but not to the extent seen in cryptophyte algae. An organic material inspired by their biology, one that could capture a high number of photons in a very small surface area, could be very useful, for example, in sensors or technologies that communicate via light energy. 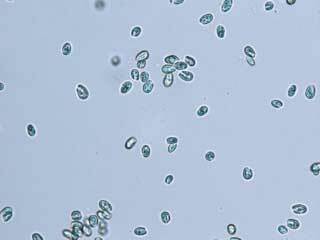 "It's become clear that the effects of molecular vibration can't be coincidence in cryptophyte algae--it is all fine-tuned--and so we'd really like to know how this same effect is engineered, and that will help us understand how the evolution of these organisms has trickled down toward these kinds of optimizations," Scholes says. "It would also be nice to work out how we can design a system that has this kind of optimization built in as opposed to randomly making supermolecular structures and seeing what happens."